I apologize for the delay. 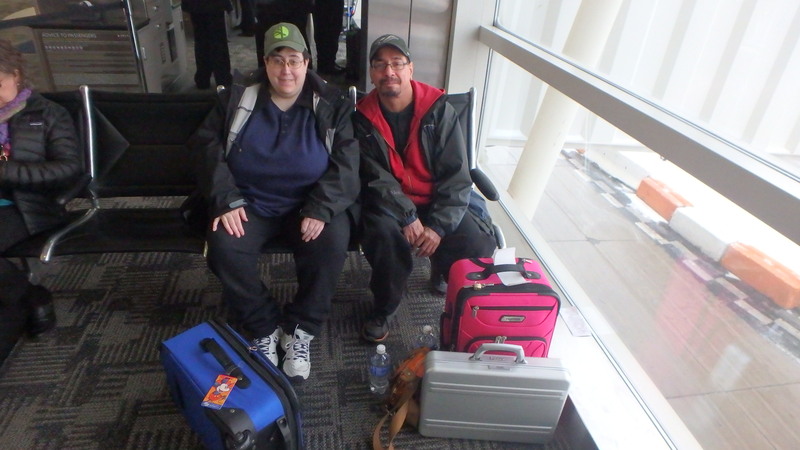 Losing my cell phone at AK made it difficult to get online upon our return to Sarnia. I did have time to finish my full report of our adventure though, and look over the 3000 photos we have. The report is approximately 11,000 words and there are about 200 photos I have selected. To make things a little easier I have divided it up into eight parts, one for each day of our adventure... And away we go! We stayed at a Howard Johnson Hotel in Romulus, Michigan prior to our flight. The weather in Sarnia the previous day had been a horror and, worried that our original plan of driving to DTW at 4:00 AM would be delayed, we made a last-minute reservation at the hotel. The HoJo was located right across the highway from the Detroit Airport and was surprisingly inexpensive. It featured a free shuttle to the airport which we took at 6:30. Upon arriving we found it a bit of a challenge to find our way around. I believe we ended up taking two separate elevators to get to where we needed to be. Everyone has heard horror stories about the TSA, so I was a tad nervous about the checkpoint but when we arrived we were selected for PreCheck and a quick hand swab. I had also read stories about the hand swab and so was a little worried that my prescription skin cream might set off an alarm but it didn't and we were on our way to our gate. It should be noted that the TSA folks seemed in a bit of a snit, barking orders at everyone. After that wee ordeal we made our way to our flight, utilizing the airport tram which conveniently let us off right at our gate! As we were waiting to board, a Delta Airlines guy announced the plane was full and that free gate check was available. Fortunately I was prepared for this and had an extra DME luggage tag on hand. This lightened our load! The plane was indeed full and though boarding seemed to take longer than I thought it should, the head flight attendant later announced that we had taken off on time. Take off was fun and once we were on our way I discovered a neat feature available; a real-time mapping of the flight on the little screen on the seat in front of me! As we passed Atlanta and approached Florida, I was surprised by the fact I could see the Atlantic Ocean from the left side of the plane and the Gulf of Mexico from the right side. Quite a view. Approaching Orlando in a descending airliner is a unique experience for a first-time visitor to central Florida. Many people were peering out the windows looking for landmarks. We flew over what I'm pretty sure was Universal Studios, and then below us a very small Spaceship Earth appeared in the distance. I tried to see Cinderella Castle too, but no luck. The plane banked hard to the left as it turned for our landing and we landed with no trouble at all, though the taxi to our gate was quite a journey. The maps of MCO I had seen prior to our trip helped us navigate our way to the DME desk, the tram being a highlight. On the way I made a quick stop at the NASA store to look for a space shuttle and a t-shirt but nothing appealed to me. The store clerk wore a shuttle astronaut jump suit. Too bad they didn't sell those! We arrived at the DME, and had a nice discussion with the two cast members at a little kiosk. One of them was named Elsa. Yes, she is asked constantly if she is Queen Elsa. 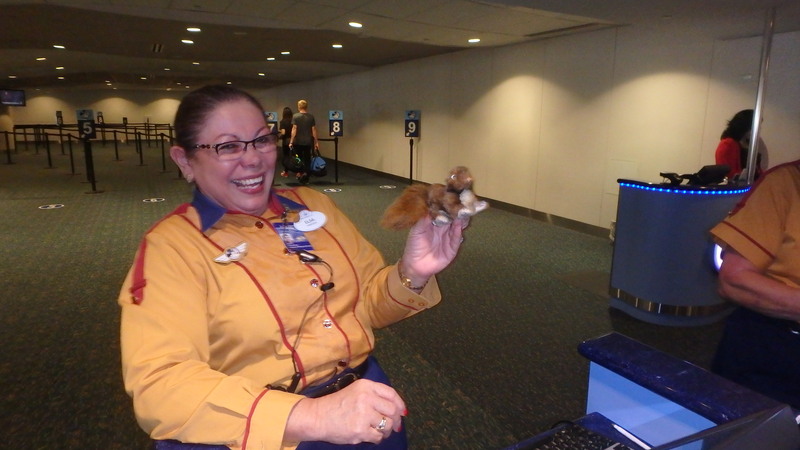 We took their picture and showed them our little furry friend, Squirrelly Shirley, who we had brought with us. The wait for the bus was less than five minutes and though we were not the first to board, we got to sit in the front seats! They showed a little welcome video as we drove along the highway, and I felt progressively excited, anticipating my first sight of the welcome arch. The bus drove past a monster hotel, an absolutely enormous building. We also drove past what I think were the Swan & Dolphin. We also saw the huge hot air balloon floating above Downtown Disney. Finally we drove beneath the welcome arch and I tried to get a few photos. The bus driver attempted to get a cheer from the passengers but i think everyone was still tired from their travels. We were now inside the bubble! The cast members welcoming us at Pop Century were very friendly. Check in did not take long at all. We were given a welcome package and the items I was most looking forward to, our Magic Bands! Dawn had picked blue, I had picked Tinker Bell Green. We stopped at Everything Pop to pick up our mugs and have a quick look around. 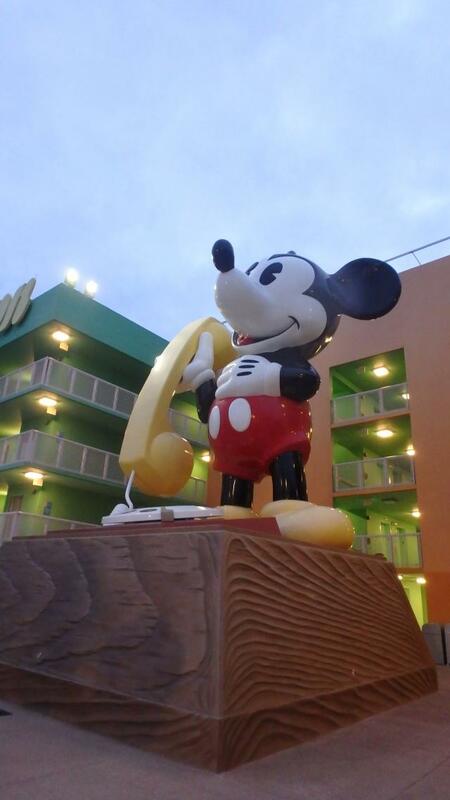 It was a short walk to building 6, the one with the BIG Mickey phone. Our magic bands opened the door to our room easily and we both tested our bands to make sure they worked. A not very hidden Mickey made of towels awaited us. Not being weighed down by our luggage was relieving. I used the very user-friendly phone (which featured buttons for at least a half dozen services) to inquire about our Garden Grocer and Apple Scooters orders. Both were waiting for us! After dealing with deliveries and having our first meal (large bacon cheeseburgers, french fries, and tie dye cheesecake!) we laid down for a nap, but for me this proved to be futile and it wasn't long before I was ready to go. Dawn, being fatigued from the trip was not up to going to any parks but she encouraged me to go and get my first glimpse of Magic Kingdom. She knew I had been waiting all my life for this moment! At this point things need to be said about the Disney bus service. It was awesome! 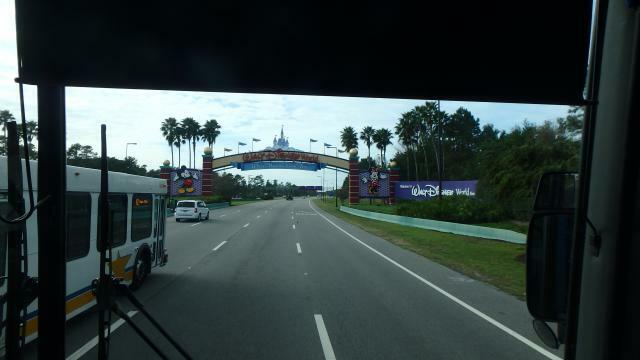 On only one occasion did I wait for more than ten minutes for a bus and that was at EPCOT on marathon day. The duration of rides to the parks seemed pretty short to me, except for once coming back from Magic Kingdom late at night. During several rides passengers struck up conversations with each other, sharing their stories and tips with one another. The buses coming back to the resort at night came quickly, one right after the other. I gave up my seat a few times, once to a mother carrying a sleeping child (who was very grateful!). I also got to ride the new articulated buses a few times. My timetable was off by a few hours and it was dark by the time the bus left. This would prove to be rewarding. As the bus approached Magic Kingdom I was treated to my first sight of the Contemporary, which had a very tall Christmas tree in front of it, and the monorail. Hearing the announcement welcoming everyone to the Magic Kingdom sent chills through me. It parked some distance from the entrance. The bus shelters were lined with lighting. My excitement as I walked towards the entrance was such that I felt as if i was dreaming. The lighting on the Train Station glowed with a soft light. Bag check was easy and I made sure to unzip everything to speed things along. The bag check people were quite cheerful. I used my magic band and there I was, standing upon the big logo in front of the train station. I had to stop to brush a few tears of joy from my face and take a few deep breaths. I felt almost as if I was floating. I entered Magic Kingdom through the left tunnel, pausing to read the sign, "Here you leave today..."
Stepping into Main Street USA was a truly surreal experience. Christmas lights added to the magic. I passed the fire station, the aroma of fresh popcorn in the air, and turning right, found myself standing in the middle of the street, facing Cinderella Castle, the timeless icon of Walt Disney World. A rush of emotion struck me; my shoulders shook, tears ran down my cheeks, and I stood there, hardly believing I was really there, almost expecting to wake up from a dream. I will never forget the impact my first view of Cinderella Castle had on me. It was covered in thousands upon thousands of white lights, glowing with hope and dreams, a stunning sight. A lifetime of dreaming, a year of planning had come to fruition. I had arrived home. I had little time to enjoy the view however, as my first Fast Pass, Anna & Elsa, was fast approaching. They were located in Princess Fairytale Hall in Fantasyland and having carefully studied maps of Magic Kingdom, I knew how to get there quickly, that is until I found Cinderella Castle blocked off for a show. A cast member cheerfully pointed me in the right direction, but in the dark I went the wrong way, ending up in Tomorrowland. 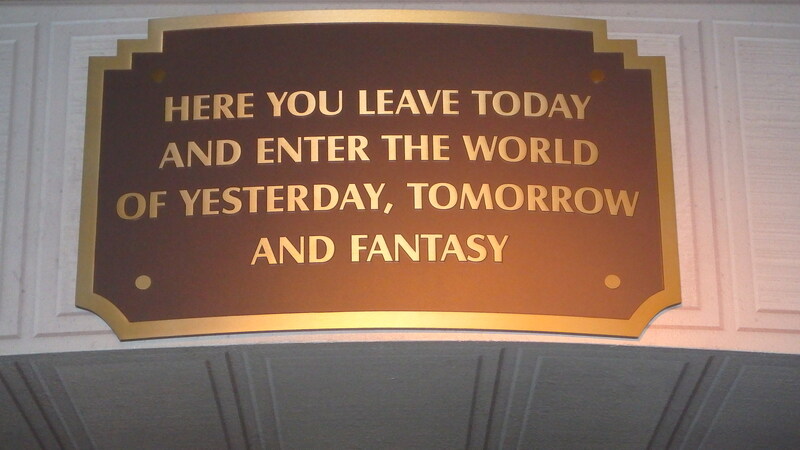 I managed to find my way to Fantasyland, finally arriving at Princess Fairytale Hall. By this time I was definitely late, really late in fact, but when I scanned my Magic Band, it flashed green! Both sisters were great, very friendly, and very much in character; they have got to be the hardest working face performers in Magic Kingdom. I found myself to be tongue-tied in their presence. About this time I realized I had left my autograph book at the resort! 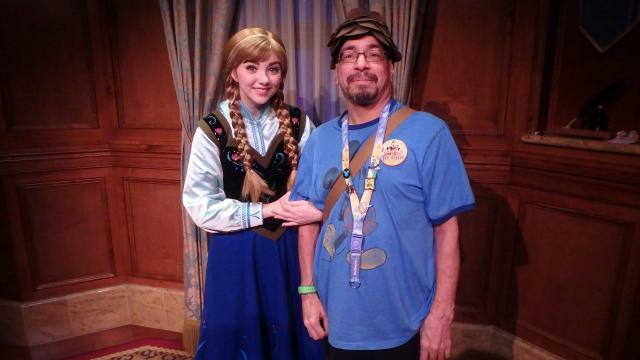 This was disappointing as I knew this would be my only opportunity to meet the sisters of Arendelle. This problem would eventually be rectified. I will explain this later. 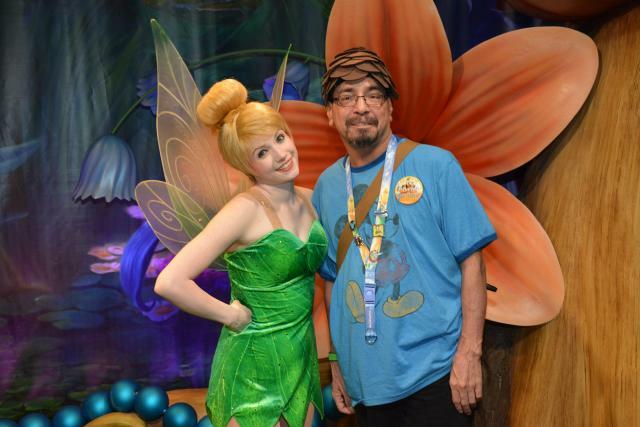 Now it was time for my next Fast Pass, a visit to my favourite character, Tinker Bell! I waited a few short minutes and then was ushered into a little room with two families. A cast member explained we would be magically shrunk to pixie size and said we would need faith and trust to do so. She then asked us what else we would need. I waited a few moments to let the children answer and when they did not do so I answered, "Pixie Dust!" The walls of the room sparkled and we were passed through a door into Pixie Hollow. Large items, such as a tea cup the size of a dining room table and a crayon the size of a boat oar were scattered around the room. Then I saw her; Tink! I had wondered if she would still be wearing her winter outfit, but she was wearing her iconic green dress and puff shoes. I did not have long to wait before I was ushered into see her. 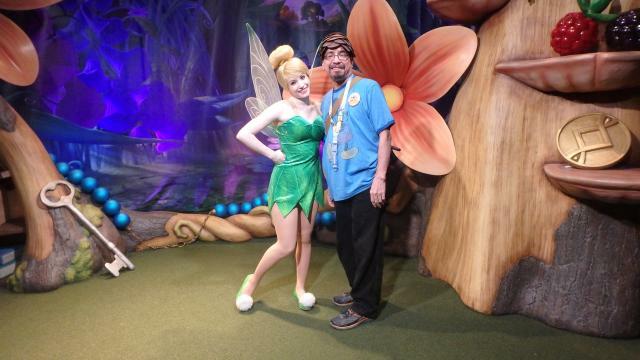 Somewhat embarrassingly to me, upon meeting Tink I became tongue-tied and was not able to talk coherently. To me, she has always embodied the magic of Disney, and though somewhere inside me I knew she was merely a college student in a costume, I became rather star-struck. We posed for a few pictures and I left, ending up in a gift shop. A note about gift shops. Though I can imagine it must be frustrating for parents to have to walk their little ones through a store every time they get off a ride, I found it a useful addition, especially if you are looking for a particular product themed to an attraction. The Cast Members are more than helpful. On more than one occasion, not having found something I was looking for, a Cast Member went above and beyond to help me find it, going so far as to call other retail locations. They NEVER simply pointed to where something was, they would always walk me over to where something was. When I purchased anything fragile they wrapped the item in impressive layers of protective paper. They had a machine that turned a normal roll of brown paper into protective paper. I had the pleasure of seeing it in action. They did not skimp on this stuff. You could probably dance the Watusi on their packages! All our fragile items survived the trip home. We had purchased Memory Maker and I made good use of this service during the vacation, having photos taken every time I saw a photopass photographer. I would note that they were not always easy to see. I feel they need to be more visible. Perhaps a brightly coloured vest would make them easier to find. For the first few days I forgot to ask for Magic Shots but remembered to do so later. The service also include a few videos and a collection of stock photos. I then walked onto It's a Small World, enjoying the hundreds of dolls and the memorable song. The ride was a lot longer than I was expecting and absolutely full of dolls and things to see, almost overwhelmingly so! 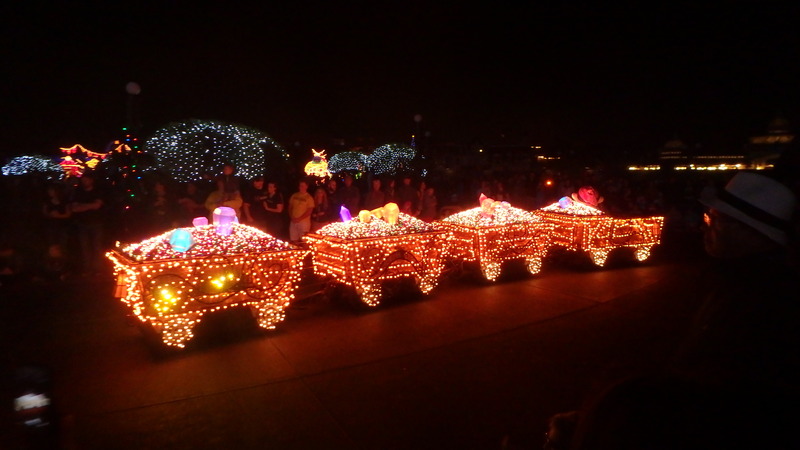 Next up, the Main Street Electrical Parade, which I saw from in front of the castle, right on the curb. It was very impressive, especially Tinker Bell, who led the parade and the Seven Dwarf's mine carts, which were stunning. I had heard the music previously and had admittedly thought it lame, but hearing it at full volume accompanying the parade found it enjoyable. It makes you want to dance! I wanted a good spot to watch Wishes!, and struggled to get around the hub which was quickly filling up with people. I ended up about a third of the way down Main Street USA, among a moderate crowd of people. First I enjoyed Celebrate the Magic, a short light show with music, a section of which features Cinderella Castle in flames, a jarring sight, but of course it has a happy ending. They also use this show as an opportunity to turn the castle lights off. There was a brief lull in the festivities before Wishes! Announcements warned that much of the area lighting would be dimmed during the show. I could have done without the Christmas music. As promised, the lights were lowered, and a hush came across the crowd. I am not sure it was happenstance or by design, but the audio seemed very loud but not unbearably so and the introductory strains of the music sent chills through me as the show began. A note about the current Hub construction. Being a first-time visitor, it didn't seem to detract from the experience. They still manage to have paths available to get you where you need to go. I found the walls at Animal Kingdom to be far more visible. Knowing that Tink would fly overhead and having seen YouTube videos of the show, I thought I was well prepared. Boy, was I wrong. Comparing a video to the real thing is like comparing cheese in a can to aged cheddar. I have seen impressive fireworks displays before, in Vancouver at an international fireworks festival and in Windsor at the annual Freedom Festival. They don't hold a candle to Wishes! I don't know that you can watch Wishes! and not cry. 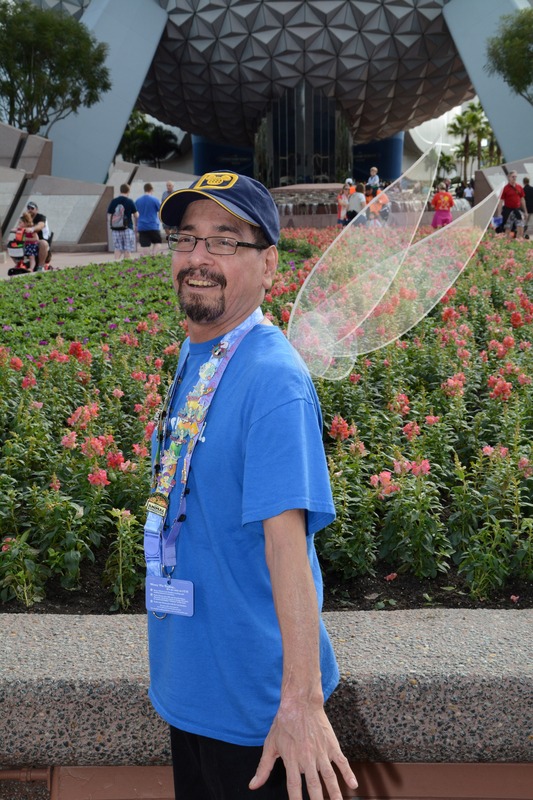 When Jiminy Cricket uttered the words, "It all began with a Wish", Tinker Bell appeared, flying from a turret high up in Cinderella Castle, wearing a costume of twinkling green lights, wings glowing white, and waving a magic wand, the crowd went wild. It was only the beginning of the spectacle. The first strains of the song made me burst into tears. It continues to haunt me. As the show progressed, it just kept getting better, building to a stunning climactic vision of music and thunderous fireworks. It left me breathless. I purchased the CD! It is difficult to explain how the show affected me. I found it to be a masterpiece of Disney Magic; a perfectly choreographed blend of music, audio, fireworks, lighting, and story. As I stood in the middle of the street, surrounded by hundreds of other guests, some carrying glowing balloons, many wearing a variety of Mickey Ears, an assortment of little princesses jumping up and down in glee, I felt part of something larger, as though I was participating in something unfathomable yet familiar. 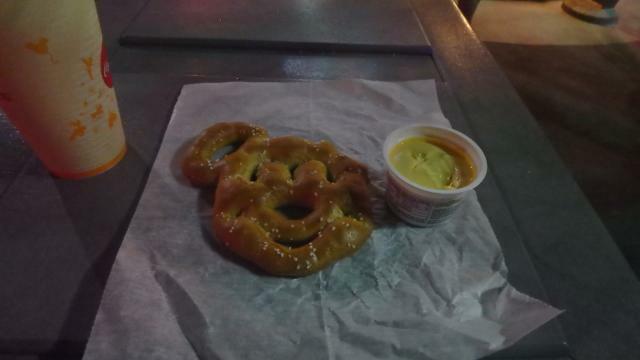 I became a citizen of this Magic Kingdom. Knowing that most of the crowd would leave the park after the show, I tried to make my way to Tomorrowland and had to be assisted by a cast member to do so. I wandered around Tomorrowland, being impressed with the lighting and generally trying to orient myself for future visits, then walked through Fantasyland and around the castle, finding the Hub far less full of people. I then made my way back down Main Street USA to the exit and the buses. Sounds like a great start. Can't wait to hear about the rest of your trip. Squirrel your writing is exquisite and your emotions familiar! Love your pictures especially you with wings. Incredibly cute! Just love this squirrel! I feel your wonder and magic! And I feel that way every time I go. ok ok ok.... You made me cry again! Can't wait to read more! And I love the wings pic! Squirrel loving it .... cant wait to read more !! Loving this report and your wings are fab! I am loving reading all about your first visit! You can feel every ounce of excitement in your retelling! Thanks so much for sharing! It was truly the trip of a lifetime. I'm already planning our return!!!!! Now that's the spirit! I cannot imagine leaving not know when or if I would be back. It would be too heartbreaking. It is bad enough even when you are coming back in a few months! I love reading trip reports written by first-timers. You included so many details that I take for granted, so it's like seeing the Magic Kingdom for the first time again. I'm so happy to hear that you're already planning your return! What a beautiful start! I wanted to wait to read it until I had time to actually sit down and take in your report. I love it so far and I'm so glad that you had such a magical trip! On to day 2!